Juniperberry oil can help calm the nerves, relieves anxiety, nervous tension and mental exhaustion. It is helpful when the prostate gland is enlarged and is used to help with the inability to pass urine, in cases of cystitis and kidney stones. It is also helpful for cellulite and fluid retention. Juniperberry oil generally helps with the digestive system, particularly in cases of obesity, over-indulgence of food and premenstrual bloating. For the liver, it has a tonic effect and helps regulate the menstrual cycle and eases painful period pains. It assists with the elimination of uric acid and therefore relieves pain in cases of gout, rheumatism and arthritis. Apart from this, juniperberry oil is also very effective for acne, eczema, oily skin, weeping eczema, psoriasis and dandruff and alleviates inflammation. Commercial Juniper Berry Oil is produced by two methods: The best oil is steam distilled from the crushed, dried or partially dried, ripe berries. Occasionally water distillation is used. The greater part of all commercial juniperberry oil, however, is derived from the fermented fruits as a byproduct of the central European juniper brandy manufacturing. 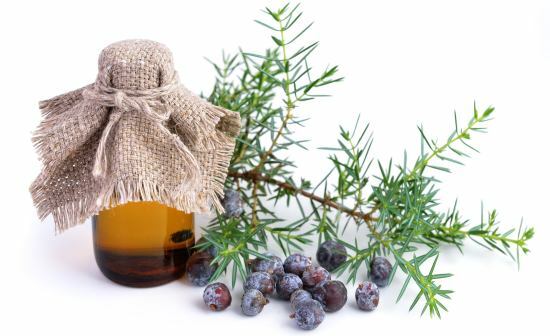 It should be noted that juniper berries contain certain amounts of fixed oil, occasionally called juniper oil.